If you want to make money from your WordPress website either as a blogger or as a regular website user and don’t know what to do, this article is for you. I get tons and tons of emails and DMs almost every day from friends, colleagues and associates asking me how they can optimize their WordPress websites and make a lot of money. The thing is, making money from your website is both technical and easy to learn. According to the Internet World Stats, Nigeria had about 92 million internet subscribers as at 2015. What this means is that a lot of people are engaging with online platforms via the internet. This means that millions of people are owning or learning how to own websites for their businesses and organizations. As a result, there are thousands of WordPress websites available on the internet that are either making money from their websites or are not. For users who wish to make money from their websites, it then means they have to do more than having a WordPress site to stand out from the pack. In this article, you will learn what WordPress is, why monetizing your website or blog is important and how to monetize your WordPress website in Nigeria. WordPress is the most used, easiest to use and most powerful blogging and website content management system (CMS) designed with PHP and MySQL in existence today. WordPress is dated back to 2003 and started as a joint effort between Matt Mullenweg and Mike Little. It is widely reported that Christine Selleck Tremoulet, a friend of Mullenweg, suggested the name “WordPress”. WordPress allows users to create and publish content for different purposes. It also allows users to select themes from pre-installed resources that are either free or paid for. With WordPress, you can also install plugins that help you achieve more functionality for your website. WordPress.com was created by the co-founder of WordPress, Matt Mullenweg. Because of the same founder, many users confuse WordPress.com with the popular WordPress.org software. 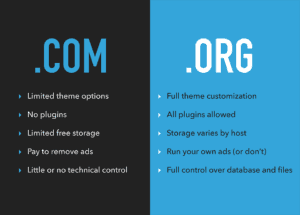 WordPress.com comes with a free limited plan and a number of paid plans. WordPress.org, on the other hand, “the real WordPress”, as is popularly called, is the platform that we all know about. It is open source and 100% free for any user to use. All that is needed is a domain name and web hosting with reliable web hosting services. This is why it is also referred to as self-hosted WordPress. A WordPress Account: Creating a WordPress account is easy and free. It is, however, more profitable to create a paid WordPress website that comes with added features and functionalities that allow making money form the web easy. Simply sign up for an account with your email address and password on www.wordpress.com. A Domain Name: It goes to assume that you have decided what you intend to do with your WordPress website. Your domain name should advisably reflect your website niche, the industry you belong to, and should be hosted on reliable hosting platforms. WordPress themes: WordPress themes give you amazing CSS designs that beautify your website and can keep your visitor coming. Plugins: A plugin, add-on or extension is any software component that adds a specific feature to an existing computer program. Plug-ins help to enable customization. It is possible: Making money off your website is not an impossible task. It is daunting, no doubt, but with dedication and commitment, you can set up your website to become a money-making machine. It is profitable: Not only is making money from your website possible, but it is also very profitable. As you would soon see, many strategies and methods abound that would help you get the most profit out of your website. It is valuable: Making money from your website is one thing, but making your website valuable is another thing. The logic here is that the more valuable your website is, the more monetized it can get and also, the more monetized your website is, the more valuable it gets. In other words, a money-making website brings you more visitors, readers, followers and community engagement. Yayyyy! You got to this stage of the article. Now that you’re here, it means you understand what WordPress is, what monetizing a WordPress website is, what you need to get started on WordPress, and why monetizing a website should be important to you. Let’s dig into some strategies that you can adopt to make money on your existing or intending WordPress website. Affiliate marketing is probably the most popular strategy to help you cash out and monetize your website. With Affiliate marketing, you can net as much as $10 to $100 from a single sale. It involves recommending a product or service to your audience using custom tracking links, and then get a referral commission for every time someone buys using your link. As many product and service companies both home and abroad offer affiliate programmes, there exist tons of affiliate programmes available online that you can sign up for with an almost endless number of niches for you to choose. The caveat, however, is that you need to be smart about this strategy so you don’t “overpromote” and come across as being too selly. These sites and brands have some of the most profitable affiliate programmes that would benefit you. Here’s how you get started. Once you have selected any of the links above or more, you will be taken to their affiliate programme page, where you can register to become an affiliate. After registration, you would have a dashboard and a custom affiliate link you can promote and advertise by putting on your website, social networking sites or email campaigns. Afterwards, head on to your website to install a WordPress plugin like ThirstyAffiliates that will help you manage your affiliate links. This plugin allows you to quickly insert links into posts and sidebar content, create custom links, and track how your links are performing on your site. Thereafter, you need to optimize and promote your links via as many content marketing channels as possible in order to get people to buy products using your custom links. Once a purchase is made using your link, you automatically get paid a commission by your affiliate company. Affiliate marketing is not as difficult as people deem it to be if only you understand the processes. It is also stress-free, as you do not need to buy or create any product. All you need is your marketing channel and your promotional skills. Yes, Google Adsense has a lot of money making opportunities. This is arguably one of the top web monetization strategies out there. Google Adsense is a “Cost per click” advertising platform and a very easy way to make money from your blog. It lets you as a Publisher display ads from Google on your website. By displaying these CPC ads with Google Adsense, you receive a certain amount of money each time an ad on your website is clicked by a visitor. With Google Adsense, cost per click is set by the advertiser. Here’s the best part. Google Adsense is stress-free. You don’t have to deal with advertisers or worry yourself about collecting money. Google transacts with the advertisers to set advert rates and determines which publishers (you) have enough website traffic to display the ads. To get started, apply to become a Publisher on Google Adsense with your Gmail account. Once set up, login to your Google Adsense account to get the ad codes to place on your website. From experience, ads in posts/content and header sections generate more clicks because they’re more strategically positioned than other sections like the sidebar. Once the codes have been added, Adsense would begin to display ads at your specified locations ad according to your niche within a couple of hours. The catch, however, is that you need to make your website generate high traffic levels so that you can make substantial revenue from the ads that you display. You should also be cautious about clicking on your own ads. Asides being insubstantial, that can get you banned from the platform. Do well to read and understand the terms and conditions of use. Selling you’re your own products (digital, especially) on your website is probably the most “commonsensical” thing to do to make money from your website. I mean, why else would you have a website if you do not wish to monetize it by selling your products via the website? Website owners and bloggers are usually known for selling digital products like e-books, plugins, themes, pictures, online courses, how-to guides, webinar hangouts, softwares, fonts and other graphics, etc. Others even provide services like dieting consultation, coaching, fitness and wellbeing consulting or you can even open an e-commerce store with WooCommerce. The idea is to sell a product or service that represents your website niche. Whether you’re writing a sponsored post for a hosting company you use and enjoy, or writing paid reviews for a brand on your website, you can also make money by writing product reviews on your site. Writing reviews with affiliated links is one particularly profitable way that review writing can be. You basically need to try out products related to your niche for free, get an affiliate link, and then insert the link in the review post to get your readers clicking. You can use PayPerPost and SponsoredReviews to connect you with businesses who may be interested in paying you for review posts. The options are interesting because with this strategy, you can make as much as $100 from just one post. Best practice would be to always write honestly objectively about the product. While you obviously need to write positively about the product, there are ways that you can sound more rational and less opportunistic. One good way to also monetize your blog is by putting up display ads on your website. Display ads are also a very popular monetization strategy. To get interested advertisers, you can contact some big brands to pitch your website value to them and get them to hire you as a publisher of their ad on your website. While Google Adsense randomizes and places ads on your site without your pick, display ads put you in control. They involve you selecting which ad is put on your site. All you need to do is determine your ad rates by yourself, and place the ads that you get. To get started, you need to gain enough visits and followers on your blog, that way, you can negotiate higher ad rates. To conclude, you should now know that your website is a money-making machine and you should now have a basic understanding of how you can achieve this. As you must have read, you definitely do not need to be a geek in WordPress to make a living. The above strategies are quite self-actionable and can be implemented by anyone who is tech-savvy and able to manage a blog. Rest assured, earnings may start slowly, but as you work consistently, your earnings will consistently increase.